Home / Six Sigma / First Pass Yield vs. Roll ThroughPut Yield: Why RTY is better than FPY? In Lean training courses, the concept of yield is discussed as a measure of the quality of a process. Yield is an important term for 6 Sigma. There are two types of yield: first pass yield or FPY and rolled throughput yield or RTY. Free Lean Six Sigma training debates whether FPY or RTY is the best measure of yield. This article compares rolled throughput yield vs first pass yield. Also, explains how to calculate each method according to the Six Sigma approach. Let’s talk about one of the key metrics in LEAN methodology. It is the concept of yield. Yield or first pass yield or throughput yield in LEAN is simply the ratio of good units produced to the number of units entering the process. Here’s a reminder of the term ‘unit.’ A unit is any item that is being processed. 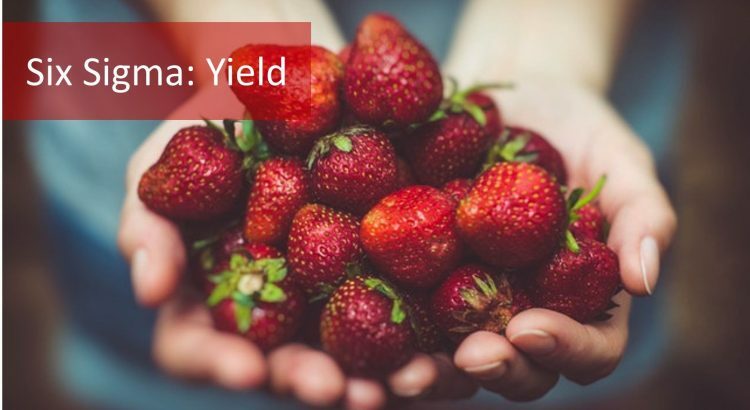 There are different ways to define yield, or you can also call it as types of yield. The first one is the first-pass yield, which is abbreviated as FPY. It is also known first-time yield or throughput yield. It is a unit-based metric. The disadvantage of the first-time yield is that it ignores or does not account for any rework of scrap products carrying one or multiple defects. In this case, the calculation occurs after any “inspection” is conducted to determine whether a unit is good or not. Let us have a look at an illustration on the first-time yield or throughput yield formula. We are looking at an email response process in a BPO company which works as a service provider for a Utilities and Energy Company. We are looking at the number of emails i.e. 550; which was responded by a team of customer service associates. Before sending those emails to customers, all of them were inspected, or quality checked. During the quality audit, 203 emails were found to be carrying numerous errors or defects. As a part of correction exercise, out of 203 emails, 190 were reworked and sent back into the email process queue. Moreover, 13 emails were so badly responded that they could not be sent to the customer at all. Therefore; the first time yield or throughput yield formula for this process would be 347 divided by 550. And this gives us 0.630 or 63.09%. How did we arrive at 347? It is the result of 550 (total number of emails) minus 203 (defects). When we want to count the number of emails that were eventually sent to the customers we subtract the number of defectives (13) from the total number of emails. Let us now discuss the concept of rolled throughput yield. The acronym is RTY. What RTY means? RTY is a measure of the overall process quality level. It summarizes DPMO data for a process or product by multiplying the DPMO of each process step. rolled-throughput yield is the preferred yield calculation method over the first-pass yield. RTY is smaller than the lowest yield of any single process. Every process step will always have a minimum and maximum yield. As the number of process steps increases, the RTY becomes exponentially smaller. Let us have a look at an illustration of RTY now. We’ll discuss two formulas to calculate RTY. Let’s have a look at the first one. We’ve got 5 process steps in this example. Each step has got input units and output units. Input units are the ones entering each process step, and output units refer to good units produced by each process step. With the help of a formula, we’ve got the first pass yield for each process step. 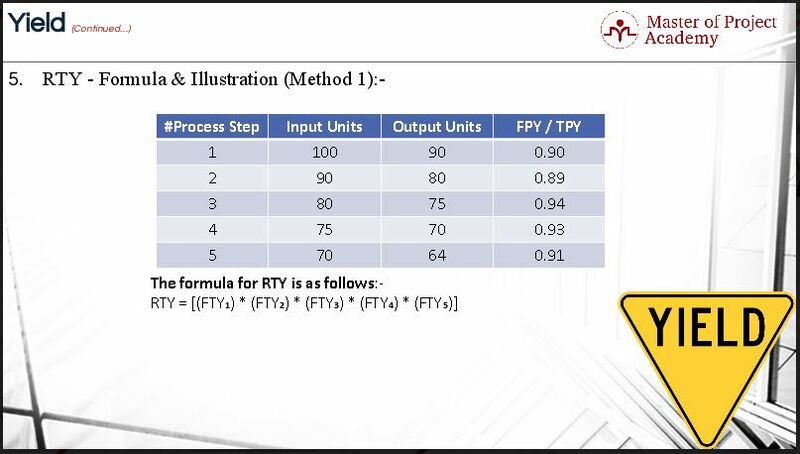 To calculate RTY, multiply the FPY of each process steps to get the answer. In this case, your equation will be the multiplication of five FPY values which will result in 0.6372. In other words, your RTY for all process steps is 63.72%. That was the first throughput yield formula. Let us have a look at the second method of RTY calculation. We’ve again got 5 process steps in this example. To use this method; you need to have two metrics i.e. DPMO and DPU calculated for each process step. We will now review the calculations to determine the DPU and DPMO. In this example, we’ve calculated DPU using another quick formula. We’ve divided DPMO figure by 1 million to get DPU for each process step. Why did we do that? DPMO incorporates 1 million defect opportunities, and we need to know defect opportunities for each unit. That is why we divided DPMO by 1 million. In the next column, we have deducted DPU from 1 to get the first-pass yield (FTY) for each process step. The 1 refers to 100%. The logic here is simple. The 100% yield for each process step minus defect opportunities per-unit for each process step is equivalent to good units produced by each process step. In this method, the RTY is calculated by multiplying the FTY for each process as determined in the previous step to get the RTY. RTY is a realistic view of the yield of any process, looking at all the process steps. The RTY of a process is a good measure of the quality of a process. If the RTY is too low, then a problem-solving team needs to investigate how the process can be improved.